bePilates: Are Your Hips Ready for Ski Season? 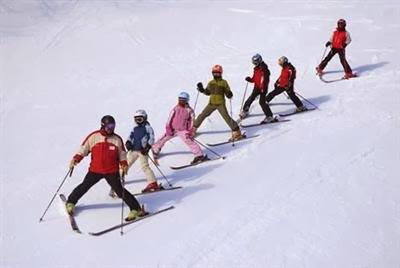 I love this image of beginner ski students. It really demonstrates how much strength and range of motion is needed throughout the joints of the lower body and in this instance, I'm looking at hips! There are some great #Pilates exercises that will get clients slope ready in no time. One thing to remember when training clients that ski is that they need this range of motion with strength, so we're not looking to increase flexibility of the joints for flexibility's sake but to work them within their current range to strengthen and then slightly increase the range as their flexibility improves.